There are total 20 MCQs on total 4 Pages, 5 MCQs on each page/Quiz. 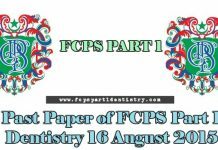 These MCQs are taken from the Paper of FCPS Part 1 Dentistry 31 December 2014 Exam taken by CPSP. Decreased serum calcium would be best describe by? On routine examination a patient have found to have accessory cervical rib what would be the consequence? An imaginary line on posterior layer (wall) of the rectus –heath usually midway between the umbilicus and pubic crest is called? Infusion of antibody in blood will indicate which type of immunity? Self analytic activity. Really helpful and motivational.